1) Sun Protection- A bad sunburn is something you do not want to deal with when you are going to be outside for a few days. 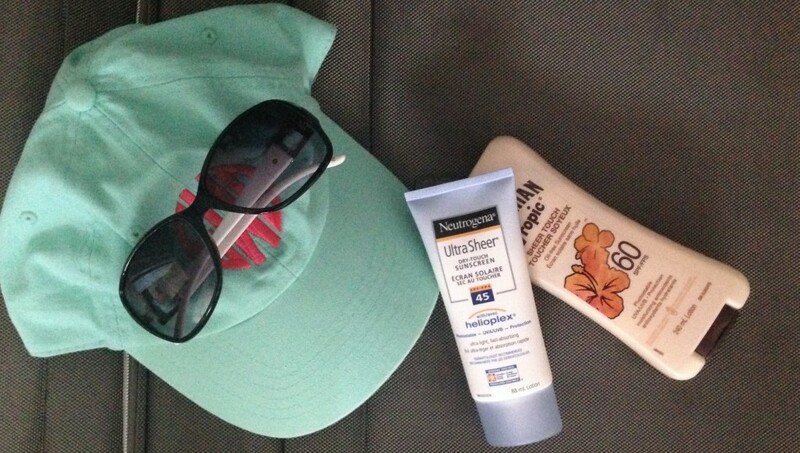 Though most people remember sunscreen, bring a hat to prevent burns on you head, sunglasses for your eyes, and a lip balm with SPF (sunburns on lips are horrible). 2) Comfortable Shoes- If you’re going to go to a theme park you’re going to be on your feet most of the day. From standing in lines to trekking across the park, you don’t want to worry about pinching shoes or blisters. Now is not the time to break in a new pair of shoes or wear those shoes you love that rip your feet apart. Make sure the shoes are broken in and can be walked in for hours. 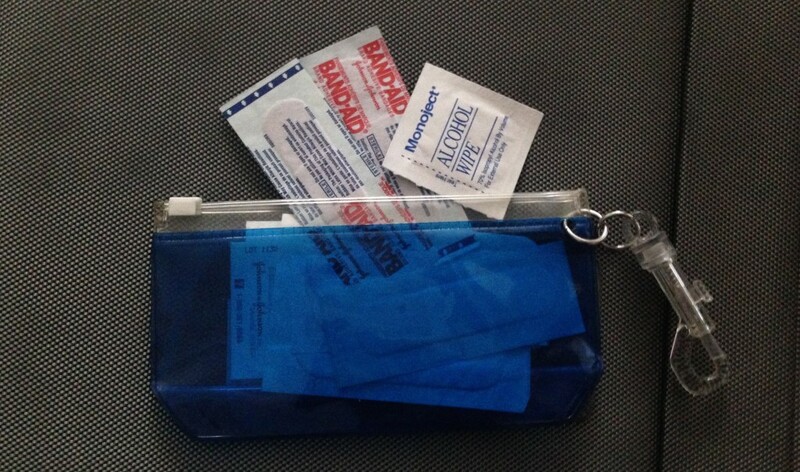 3) Mini First-Aid Kit- From falls, to scrapes, to cuts on glass you should really have one of these handy. It’s no fun to get hurt while at the theme park, but you’ll be happy to have bandages and antiseptic wipes on hand if you do. It can be really hard to get bandaids and other tiny first-aid necessities in the park. Besides, someone always seems to get hurt when I forget the little first-aid kit. Mine is a makeshift kit made from an old soft sunglasses case. You don’t need a ton of stuff, just some alcohol wipes and bandages (regular and blister) will keep any wounds nice and clean until you leave the park. 4) Pack Extras- I know most people encourage packing as light as possible when going on a trip, but I’d rather be safe than sorry. Pack a few extra outfits just in case there are spills or some other accident happens. I’d rather carry 2 extra outfits around than be stuck with wrecked/dirty clothes. 5) The Luxuries- Though these aren’t necessary to enjoy your trip, they may be a good idea depending on the weather, or type of rides you are going on. A water bottle is always useful to bring. Fill it up and pack it in your bag before you go to the park. It will keep you hydrated and save you from having to buy the $5.00 bottles of water they sell at the park. I also bring a little plastic zip lanyard to carry my park pass, bus ticket, and anything else I’ll need. It keeps all my things in one place and keeps them from getting wet if it rains or if I decide to go on Splash Mountain. 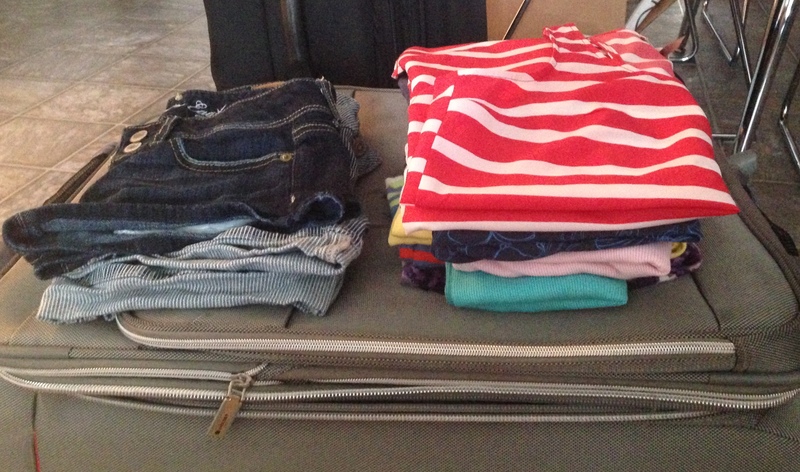 I hope these theme park packing tips and tricks help make your vacation more enjoyable! 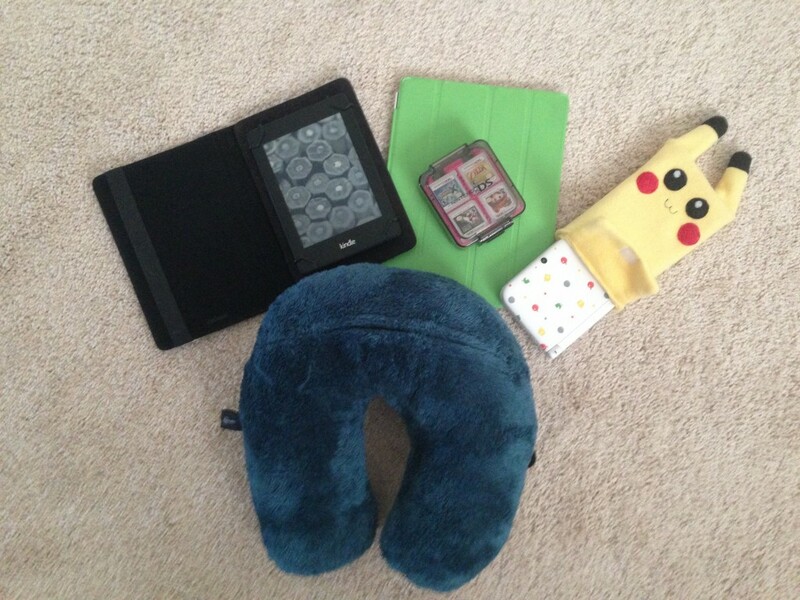 Since I spent this weekend flying to New York, I thought what better to do than show you what I bring with me on the flights. The contents of my bag tend to vary depending on what time of year it is, the length of the flight, and the length of the layover. To start off, I like to bring my Sherlock messenger bag with me. I got this bag a few years ago from a shop called Bag Chemistry on etsy. 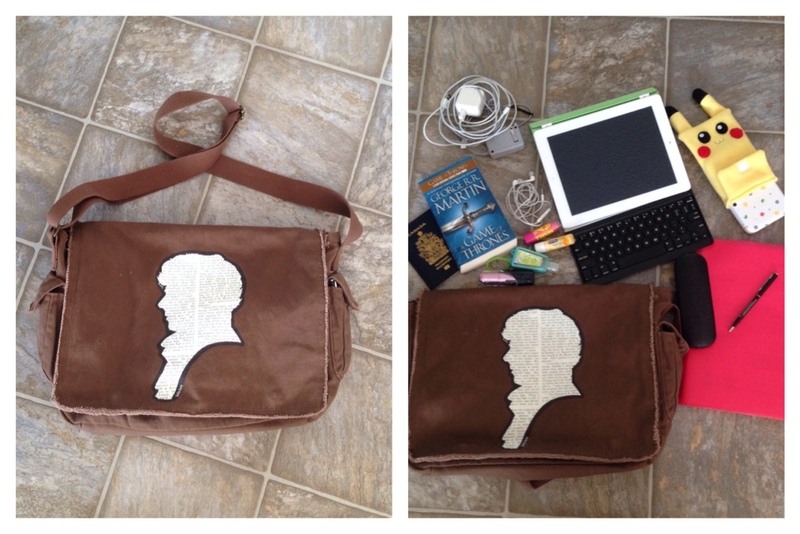 I love this bag because it’s very light and keeps all my belongings at arms reach when I’m in the airports. I’ve put this bag through so much, but it’s really good quality and has yet to rip or show much wear. I also like this bag because it fits easily under any of the seats on-board. I really hate putting my stuff in the overhead compartment because I don’t like having to get up constantly to get my things, so this was a must. Apple in-ear headphones- I’ve always had issues with earbud-type headphones. They always hurt my ears after wearing them for a while. These headphones are the only ones I can wear with no issues at all. They cancel out some of the noise from the plane, have a soft, squishy earpiece, and are just really comfortable to wear. iPad- I used to bring a laptop with me whenever I went on a trip, but honestly they’re so finicky with them. You have to take them out, put them away, take them out again, put them away again, get them swabbed, and have them go back-and-forth through the security machine a few times. To avoid what I’ve dubbed the “laptop security dance” I just bring my iPad with me. I can watch my downloaded TV shows and movies (for this flight it’s Sherlock series 3), work on blog posts/homework, and play any games I have downloaded without the fuss of a laptop. Logitech bluetooth keyboard- I bought this earlier this year from the Apple store so I could type up notes, papers, and blog posts more efficiently. I like this little keyboard because it has a long-lasting rechargeable battery, it snaps onto my iPad like a cover (so the keys won’t get damaged), and it has a slot to stand up the iPad when you’re typing. It’s a pretty good product, but I still bring my smart cover with me on trips because I don’t like the angle the keyboard keeps the iPad at when I’m watching videos. 3DS-XL with case- I always like to bring a handheld game with me on my flights. When all else fails to amuse me, there’s always Mario or Pokemon close by. I really like the 3DS XL because it has a large screen that’s easy to look at, and the controls are nicely spaced out. My Pikachu 3DS XL case is from Fleacircusdesigns. It does a good job of protecting my 3DS from getting scratched or damaged, and it keeps everything nicely together so I’m not looking everywhere for the stylus (it sometimes falls out). The only issue I’ve had with this case was part of Pikachu’s eye started to come loose. It was just an esthetic thing and nothing a little glue couldn’t fix. Book- I always like to bring a new book with me in case I have some time to read. The book I’m bringing with me on this trip is A Game of Thrones by George R.R. Martin. I’ve tried reading this book before, but I didn’t have enough time to properly take in the book. Hopefully I’ll get a chance to really enjoy this book during this trip. Charging Cables- I like to bring the charging cables for all my gadgets with me just in case something happens to my luggage or there is a massive delay at the airport. Nothing is worse than having the batteries die on all your electronics when you need them most. Hand Sanitizer- Planes and airports in general can be full of sick people. In order to try and not catch anything while traveling I like to bring hand sanitizer with me. The one I am currently using is Island Margarita from Bath and Body Works. I like that it has a very fresh scent, light scent. Some hand sanitizers I’ve had are way too scented and overwhelm you when you’re trying to eat, but this one does not have an overbearing scent. Travelo- For those of you that don’t know what a Travelo is, it’s basically a mini perfume diffuser that can be filled with whatever scents you own. It’s nice to be able to carry a scent with me if I need to freshen up after a flight. It’s also approved for on-board travelling so you don’t have to worry about it getting taken away by security. My parents got me mine for Christmas but I’ve seen them in the travel section at Shoppers Drug Mart. PENS- This is in all-caps for a very good reason. Too many times have I gone on a trip without pens and then had to beg and plead with everyone around me in order to get one. It’s especially nice when you have to fill out custom forms and can just complete them on the plane. Don’t make my mistake. BRING PENS! And that is all for what’s in my on-board travel bag. You deserve an award if you made it through this blog post.